[%pageBreakSettings nobreak=true] "Mom, can we get Eggos?" That's my oldest son, Everett. He's five-and-a-half, and he can spot a logo from across the street. We're trying to cut down on his TV, but on Saturday, I was letting him watch a cute Disney movie about a girl who saves an old estate from would-be subdividers. Eggos now come with a spy-decoder doohickey. I decided it was time for the talk. "You know, sweetie," I said, working up to it, "if they have a commercial on TV for food, it's not that good for you. They spend all of their money making advertisements, instead of making the food good and getting quality ingredients. Do you understand?" He said yes, he understood. We had the "quality" talk a couple of weeks ago, when we were purging his bedroom of cheap plastic toys. "I'll make waffles for you," I said, "and we'll use Gilda's eggs. And they'll be good for you, and you'll know, because no one is in our kitchen making a commercial about them." 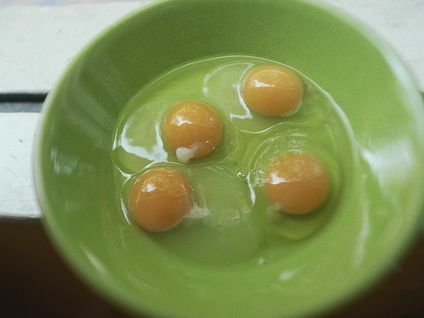 [%image "egg yolks" float=left width=400 caption="The yolks of Gilda's eggs."] 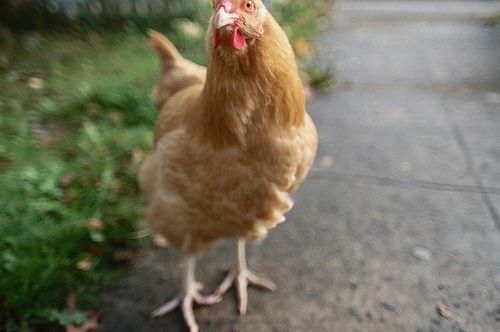 Gilda's our chicken. She's a Buff Orpington, and she's Ms. Reliable: she lays eggs all through the winter. We know they are healthy, not because of the lack of TV cameras, but because she eats grass, and dandelion greens, and blackberry vines, and slugs, and worms, and maggots, and spiders. Oh, my. I try to be matter-of-fact with Everett about this kind of thing, but really, I'm angry. SO angry. I've been reading Michael Pollan's In Defense of Food all day while breastfeeding my youngest, Monroe, and I'm sure he's been getting a good measure of MAD along with his milk. Last week it was Plenty; two weeks ago, Animal, Vegetable, Miracle. I keep adding more to my Amazon Wishlist, and getting angrier. I've been hanging out on the periphery of the local-foods movement for the past few years, watching Flickr friends create delicious meals from their gardens, writing about the development of the locavores project, and occasionally trying to make a dish or even most of a meal out of produce from the farmers' market, but never really throwing myself in deep. I proudly eat at Burgerville, the little burger chain that gets all of its produce locally and in season and its hamburger from Oregon Country Beef — grown around Madras, Oregon, where my mom grew up on a dairy farm, where my cousin owns a feedlot. 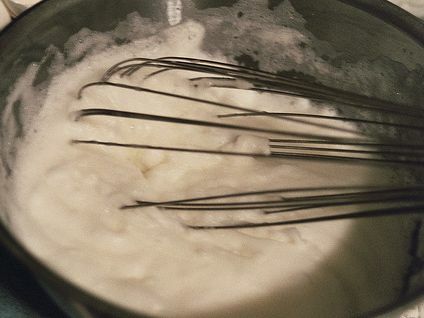 [%image "egg whites" float=right width=400 caption="The whites of Gilda's eggs."]Urgghhh. There's the word. "Feedlot." Now my stomach is churning. I've read three times, now, just why it is I shouldn't eat animals that come from industrial farms, the ones that feed their cows and pigs and chickens corn, and soy, and corn and soy by-products. It's not good for them. It's SO not good for them, that it's the main reason why we have so many diseases. You see, eating corn and other seeds — not grass — changes the pH of a cow's stomach. Kablooey: E. coli. Mad cow. If you're a chicken, salmonella. And the government subsidizes corn and soy, subsidizes the rapid destruction of our country's farmland. That's why all our animals are fed it — it's cheap. Consequences be damned! My husband brought home breakfast sausage from Safeway last week, and I just looked at it in horror. I couldn't believe he would betray me like that. But even worse, the world has betrayed me. I have an MBA. I really should, by all rights, be approaching this from a capitalist point of view, or an economic point of view. But now the same principles that keep me from working for a tobacco company would keep me from working for Kraft, or Clorox, or PepsiCo, or General Mills. Don't even get me started on ADM. Archer. Daniels. Midland. Even when I say it in my mind, I spit the words out with venom. Did you know that many of today's crops are genetically engineered with a "suicide gene," a gene that won't let the crop reproduce? Did you know that, for many food plants like wheat and tomatoes and apples, only 20 percent of the known varieties remain in existence? One in five? Did you know that your average carrot has one-third of the nutritional content as did a carrot in the 1930s? Did you know that crab is sent from the West Coast to China to be removed from its shells, and then back again to our supermarkets? Did you know that industrial farms are systematically stripping the topsoil from our arable land until nothing at all can grow? Did you know that most of America's bees are sent to California every spring to pollinate the almond crop, that the resulting bitter honey is thrown away, that the bees eat high-fructose corn syrup and many of them just die from the stress? [%image gilda float=left width=400 caption="Gilda."] I'm never eating an almond again. It's not easy for the kids, I'm sure, sunk in this world that is marketing YoGos to them as health food, where their school cafeterias are lauded for using food from local farmers when One. Ingredient. A Week. comes from local farms and the rest of the time it's chicken nuggets, mini-pizza products, and animal crackers — neither animal nor cracker — packed with trans-fatty acids and various inventions of the food industry. It is this world that makes their mom a passionate, raving nutcase, going on and on to anyone who will listen about how she's never going to buy processed food, as long as she lives. I stare up at the boxes of Cocoa Puffs and Rice Krispies (it has only been a month, I haven't nearly finished clearing out my pantry) and want to throw things. It's OK. I can do this. I learned how to strain cooked eggs and cream to make crème brûlée from a French-Moroccan chef in Charlotte, North Carolina. I learned how to emusify mayonnaise from the sous chef at the Cajun Cafe in Portland when I was 19. I learned how to make pesto using a mortar and pestle from a book; I learned how to caramelize onions by trial and error. My mom taught me to knead bread, make yogurt, and whip cream. I have made waffles, not once but many times. I know how to mix together stone-ground organic wheat flour (ground by stone, the good stuff from the outside of the wheatberry stays intact), baking powder, and salt; separate Gilda's eggs, beat the whites to stiff peaks, then fold them into the flour mixture combined with the egg yolks (tinged orange from the good nutrients in the weeds and slimy things living in our yard), melted butter (from cows fed on grass; it's yellow in a way that reminds you what "buttery yellow" really means), and organic milk delivered from a local dairy in fat glass jars. Leggo that Eggo. I will make waffles, I will serve them with butter and Madras carrot honey and, for me, whipped fresh cream and frozen Willamette Valley blueberries. It will not be fast or easy, there will be no toys free with purchase, my waffles will never be associated with a major motion picture. Everett will tell me that I am the "best cooker in the WORLD. I'm serious," and later he will ask me for some other sort of food-product-that-is-not-really-food advertised on television and I will begin the conversation all over again.